Gardeners Hand Scrub filled with Pumice Powder to scrub away dirt and grime for cleaning the toughest mess while eliminating odors and bacteria from the skin. Orange Scrub Ingredients: Distilled Water, Sodium Cocoyl Isethionate (coconut oil derived), Vegetable Glycerin, Cocamidopropyl Betaine (coconut oil derived), Cetyl Alcohol, Orange Peel Powder, Basil Powder, Sugar, Pumice, Basil Essential Oil, Orange Essential Oil, Eco Natural Broad Spectrum Preservative (Benzyl Alcohol, Salicylic Acid, Glycerin, and Sorbic Acid). 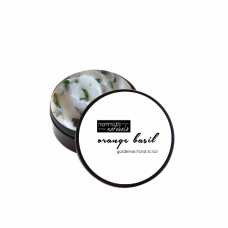 Orange & Basil Oil-Helps dry, irritated skin, keeping it soft and healthy and has antiseptic properties, while cleaning tough dirt and odors from the hands. 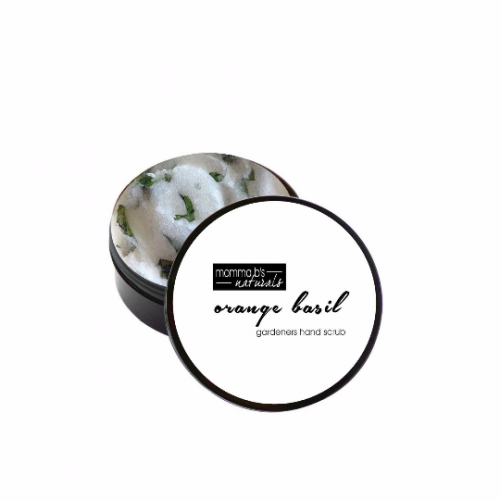 Basil has antiseptic properties and used in the treatment of cuts and wounds. This herb also prevents and soothes insect stings and bites. Basil contains antibacterial and antifungal compounds, relieving inflammation and itch. The antioxidants present in Oranges fight free radicals and thus prevents aging faster. It also helps in restoring collagen in your body which is responsible for skin firming and prevents premature aging of skin.